Iraqi Captain of the Jordanian owned cargo ship M.V. FARAH III that drifted and struck the ground in LTTE territorial waters off Mullaithivu Saturday, Ramaz S. Abdul Jabbar, has contacted the Jordanian Ambassador in India Sunday evening, from the Peace Secretariat of the Liberation Tigers of Tamil Eelam (LTTE) in Kilinochchi, conveying the message of safety of his crew members. Asked to comment whether there has been any military standoff between the Sri Lanka Navy and the Sea Tigers, the Captain of the ship told TamilNet: "this, I guess is all political. We are all safe and we have good cooperation here." "We were offered a good place to sleep," the Captain said. The crew-members have also been to shopping in Kilinochchi Sunday, he further said. Head of ICRC's sub delegation in Vanni, Ms. Katja Lorenz, was present together with the Captain and his Jordanian and Egyptian crew members, when they talked to their national authorities and their families. 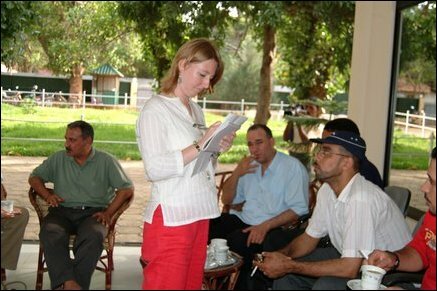 24.12.06 Drifted ship's Captain talks to Jordanian Ambassad..